At Sterling Carpet One, we are more than just the go-to flooring store. We carry a selection of other home products offering name brand, unique options to accent your home of office. Our window treatments are decorative, affordable and functional and they are all user-friendly. Window treatments are coverings that are made out of fabric or other materials. They are used to cover windows, which influences levels of light in a room. Window treatments can be used to filter, block or increase light. Hunter Douglas has been a leading industry window treatment company for over 30 years. Offering not just innovation and style but blending technology to serve purpose in your environment as well. Hunter Douglas shades take on a designer approach using real, woven materials to create lush, trendy fabrics to illuminate your windows. Within our showroom, we have a variety of styles and display available to look at. Our team of design consultants will provide you details on all of our options ranging from energy efficent shades to cordless, lift retractable and motorized options for large expanse windows and more. Our team also provides in-home measures, design advice, and in-home installation. Additionally, we do offer blind cleaning service using ultrasonic methods so that you do not have to worry about getting out the duster again. 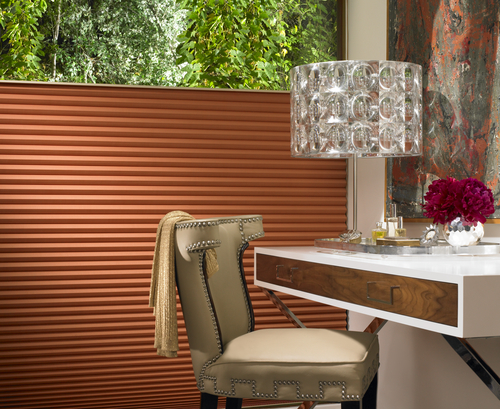 Hunter Douglas window treatments have the reputation of being fashionable as well as multi-functional. Our window shades are designed to absorb light, bringing it deeper within any space, redirecting it, diffusing or blocking out light entirely. Our premier products like Luminette, Duette, Puoroette, Silhouette and more streamline natural light through different styles ranging from sophisticated roman shades, traditional sheers, and vertical or horizontal blinds. Whether you're looking for a classic style or are in need of gliding window panels, Hunter Douglas is sure to please the eye! 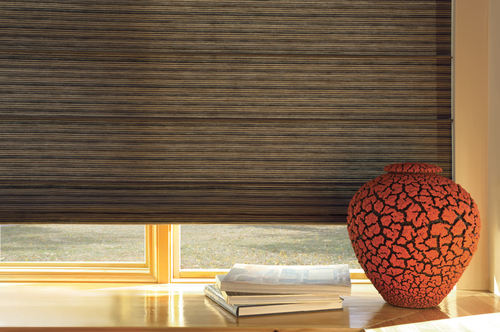 Another benefit and feature Hunter Douglas window fashions offer are the unique cellular struction to shades. The construction is primarily used to prevent heat from escaping in the cooler months and keep cooled air in during summer. This smart design keeps you feeling comfortable all year-round while maintaing energy to save on eletric bills. Come visit us today to learn more about our Hunter Douglas selection or to learn about the type of window treatment most suited to your needs! Sterling Carpet One is proud to serve customers throughout Grand Forks, Walsh, Steele, Griggs, Pembina, Cavalier, Nelson and Ramsey.